Open Textbooks are textbooks that are licensed to be freely available to the public. The textbooks can be downloaded at no cost or printed more cheaply than traditionally published textbooks. The SJU Library is actively engaged in an Open Textbook initiative. Find out how you can use or adapt open access textbooks to offer your students more affordable course materials. 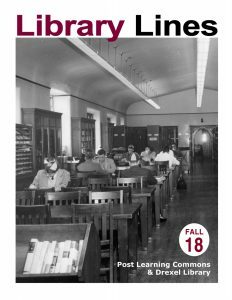 Fall Events; Grants received to support the University Archives and Special Collections; New Electronic Resources; Interview with Tom Kaeo, Director of the Office of Research Services (now located in Suite 160 Drexel Library). Take a few moments and read about the happenings at your university library!